When the credits roll and you've left the park, when your Disney day is over, how do you take the magic with you into your everyday work and life? Beginning with her first position as a summer intern at Walt Disney World, through her role leading synergy and special projects for Disney (reporting to former CEO Michael Eisner), to her work with top leadership at Walt Disney Motion Pictures sharing the magic of Disney films around the world, Jody unpacks secrets that can change the way we understand ourselves, our work and relationships, and how we can find our own path to happiness. You will read her stories about working with Walt’s nephew, Roy E. Disney, her front-line role in the opening of theme parks around the world and her own journey to discovering how to bring some Disney magic into every day. The wish for happy endings is written in our hearts. Every park guest or movie watcher is looking for their own “happily ever after,” as they ask the questions: What’s my story? Does it matter? Will the story end well for me? Jody’s personal experiences and her underpinning faith help her to offer practical and sometimes unexpected principles to better appreciate and navigate our own stories . Jody’s entertaining storytelling will satisfy a reader's desire to open the doors and peek inside the castle – and more, to unlock and illuminate life’s true treasure. 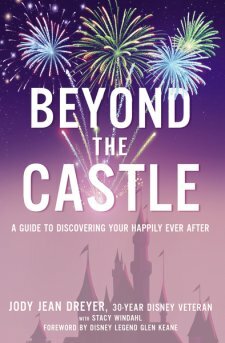 A a huge Disney history fan, I have several books on the Disney company and continue to get my hands on all books Disney including a few written by former cast memories such as Jody's book. While I enjoy these books and learn more about the parks or experiences from the person, this book had a different spin as it came at it with some what of a faith perspective, but I didn't feel that it was carried throughout the entire time. I also enjoyed the career and legacy that Jody leaves behind and the glimpse that the reader gets into reading the book of her life into the company, which is a privilege for any Disney fan. I enjoyed the stories, but was hoping for these significant moments to have more details. I think that Jody writes about her experiences, but I don't feel the emotions, nor does she really go in depth of the experiences. This may not be the reason for her book, but I was really hoping to read unique stories in depth with things that we don't often get. I really feel that Jody has the capacity and experience to do so. This book feels more like a leadership, self-help book instead of book about one of a kind stories about the amazing company and the lessons she learned, which I think is helpful. I think this book is a great read and worthy of reading for any person who loves to read. I do love how she talks about the "branding" of the company. I found this to be very interesting. Overall, I recommend this book and the lessons that Jody talks about in this book. As a Disney fan, we can all learn something from it! I give this book a 4.5/5 stars. A favorable review was not required. Please do not use my review without my consent.